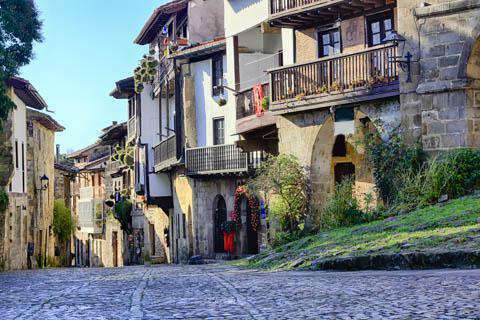 How much does it cost to travel to Santillana? How much money will you need in Santillana? €84 ($95) is the average daily price for traveling in Santillana. The average price of food for one day is €25 ($28). The average price of a hotel for a couple is €95 ($107). Additional pricing is in the table below. These average travel prices have been collected from other travelers to help you plan your own travel budget. How much money do I need for Santillana? A quaint town outside of Santander in northern Spain, Santillana de Mar is renowned for its medieval architecture. One of Spain's prettiest villages, Santillana del Mar and its cobbled streets are lined with palaces, churches, and balconies full of flowers. There are plenty of traditional shops selling local specialties, and it is nearby the UNESCO world heritage site of the Altamira Caves for something a little different. The entirety of the town, with outstanding examples of medieval architecture, is worth walking through to see the sights. Along the way you will see a number of historic churches, homes, and buildings so well-preserved that you will feel transported to another time and place. One such place is the Collegiata de Santa Juliana, a beautiful Romanesque church and abbey dating back to the 12th Century. In ancient times it was one of the most powerful monasteries of Spain, attracting many noble families to build houses in Santillana del Mar. Beyond churches, some other significant examples of architecture include Gothic houses like the Casa del Marques de Santillana, noble homes like the Casa de los Hombrones, a handful of palaces like the Palacio Barreda Peredo, a number of Gothic towers like the Torre de Don Borja, and even a former marketplace called the Plaza Ramón Pelayo o del Mercado. There are also a few museums worth a visit including the Museum of the Inquisition and Torture Museum which contains an impressive collection of instruments of torture from around Europe, including those used in the Spanish Inquisition. Also in the vicinity is the site of the Altamira Caves which was named an UNESCO World Heritage Site for the well-preserved cave paintings inside. Santillana del Mar is a pretty little medieval town known for its perfectly preserved cobbled streets and stone buildings. The streets are flanked with nobles' and landowners' houses, churches, and other structures that date back between the 15th and 18th centuries. You will also find a handful of museums and traditional shops where you can buy some of the local specialties of the Cantabria region. The town does cater to tourists with an abundance of shops and attractions, as well as a number of cafes and eateries to indulge in after a long day of sight-seeing. Once you have explored the village, admired its medieval architecture, and shopped around for your authentic Cantabrian souvenirs, you might want to relax a while on one of the nearby beaches. Some of these include Urbiaco (5 km away), Cobreces (10 km away), Comillas (17 km away), Oyambre (20 km away) and Suances (10 km away). When exploring the ins and outs of villages and the surrounding areas it is convenient to have a rental car. The village of Santillana del Mar and others nearby are also known for their local festivals held throughout the year. At the end of June the Fiesta de Santa Juliana is held in honor of the town's patron and is marked by a procession, Mass, and a special dance to St. Julia. The Fiesta de San Roque takes place on 15th & 16th August and features parades and local religious festivals. And then at the end of September the Festival de Música Infrecuente (Uncommon Music Festival) takes over the town with a great mix of world ethnic and vintage music. If that isn't enough, Santillana del Mar also has a zoo. The northwest of Spain is an area bordered by coastline, making seafood and fish a common staple for dishes throughout the region. The Spanish word for seafood is "marisco," and fresh catches include things like clams, mussels, pod razors, cockles, crabs, barnacles, crayfish, snails, lobster, squid, sea bass, hake, scorpion fish, anchovies, sardines, and tuna. Pulpo a feira is a common seafood dish of octopus prepared with oil, salt, and hot paprika. Then there are empanadas-pies made with a traditional dough, filled with onion, pepper, and some meat, usually tuna, veal, or seafood. Being close to the mountains as well, Cantabrian cuisine also features cattle and game like deer and wild boar. Popular beverages include hard cider, wine, and orujo (a type of pomace brandy), and typical pastries include sobao pasiego and quesadas (a light sort of cheesecake). By plane, the nearest airport is Santander Airport, located 5 kilometers east of Santander. It operates domestic flights, primarily from Madrid, and international flights with Ryanair from London, Dublin, Brussels, Rome, Milan, Frankfurt, Paris, and Amsterdam, plus other international flights to Bilbao. By train, RENFE operates daily from Madrid and Alicante to Santander with stops in the main cities of Palencia, Valladolid, and Avila along the way (5-6 hours from Madrid to Santander). There is also a RENFE station in Torrelavega, which is only 10 kilometers from Santillana del Mar. Autobuses Garcia operate bus services from Torrevelaga to Santillana del Mar and back. There is also a ferry terminal in Santander if you wish to arrive by ferry from the UK. Santillana del Mar is about 30 kilometers from Santander. Car rentals and buses from Santander to Santillana del Mar are available.